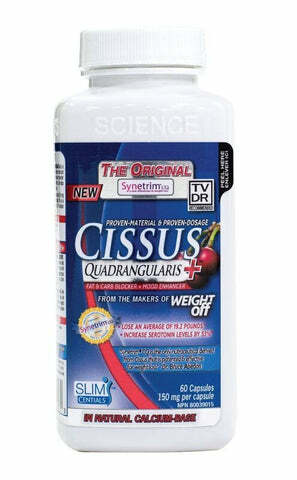 Synetrim ® CQ is known as ‘THE ORIGINAL CISSUS QUADRANGULARIS’ and is a member of the grapefamily native to West Africa. Synetrim CQ helps to support healthy blood glucose levels and could be a complement to a healthy lifestyle that incorporates a calorie-reduced diet for individuals involved in a weight management program. A source of antioxidants. Accept no substitute, Demand Synetrim! Synetrim ® CQ: Cissus Quadrangularis Extract [Stem & leaf]150 mg Providing: 3.75 mg [2.5%] Keto-Steroids. Non-medicinal: Capsule (Kosher & Halal certified gelatin), and Silicon dioxide. Could be a complement to a healthy lifestyle that incorporates a calorie-reduced diet for individuals involved in a weight management program. A factor in the maintenance of good health. Adequate calcium (and vitamin D) (throughout life) as part of a healthy diet, (along with physical activity) may help prevent bone loss/osteoporosis (in peri- and postmenopausal women) (in later life). Helps to support healthy blood glucose levels. If you have diabetes, consult a health care practitioner before use. If you experience symptoms of hypoglycaemia including feelings of anxiety, dizziness, tremor, sweating, nausea or headache, discontinue use and consult a health care practitioner.